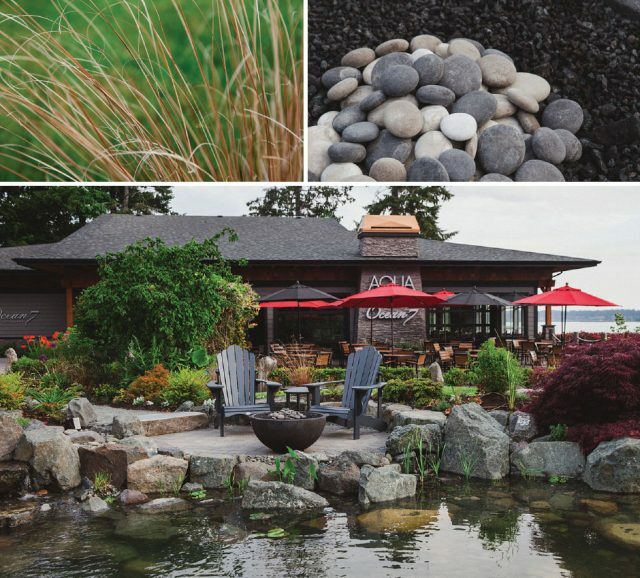 Local businesses team up to provide a resort sanctuary that naturally soothes and inspires. Fresh water flows through the Kingfisher Oceanside Resort and Spa’s new Serenity Garden. The soothing sound of water travelling over stone provides the foundation for this striking landscape. From the vantage of one of seven patio nooks nestled amongst the foliage, visitors can rest in Adirondack chairs that face panoramic views of the ocean and snow-capped Coast Mountains. Each patio features a gas fire bowl where nighttime visitors can sit by the warmth of a fire, listen to the rush of water, and enjoy the glow of ambient lights placed throughout the garden. The stream meanders through the terrain and passes a variety of grasses and willow shrubs that line its banks in an effort to reflect a natural stream environment. 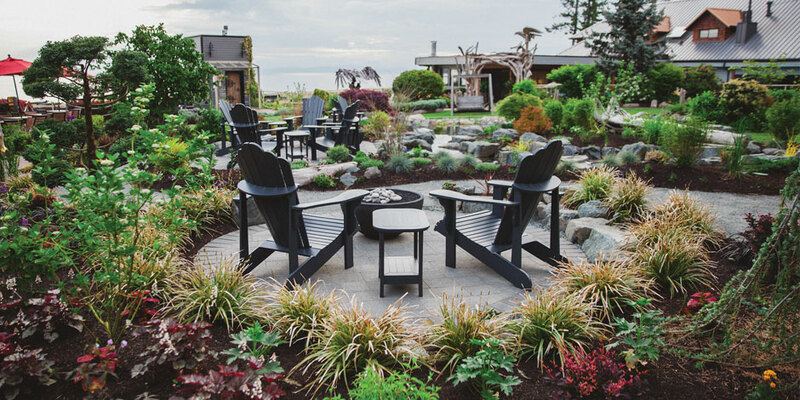 Arianne Hueny, owner of A Rose in Thyme Landscape Design, worked with Island Waterscape to envision the garden layout and bring it to fruition. Hueny explains that she curated a mix of native and ornamental plants that will provide colour and interest throughout the year. “I want people to walk out of their rooms in February and experience wafts of fragrance coming from the garden,” she says. In addition, many plants were chosen to attract pollinators—which are an integral part of a thriving ecosystem. Although in its infancy, the garden is already thriving; vibrant fuchsia flowers tempt the hummingbirds, osmanthus emit a rich fragrance, and Japanese maples add classic beauty to this diverse space. One can imagine how the garden will evolve into a lush landscape with crawling groundcover, large blossoms, and mature trees. Greasly says that the resort was ready for upgrades, and the addition of the Serenity Garden is just one of many changes. Recently, their restaurant saw major renovations, and the modern building now includes a garden-side patio. The resort is also renovating their spa and suites. The time is right for the Kingfisher to pursue new features, and these changes are indicative of the Comox Valley’s growth. As spring flowers bloom, so do the prospects of the resort—with the lovingly crafted beauty of the Serenity Garden at its centre.